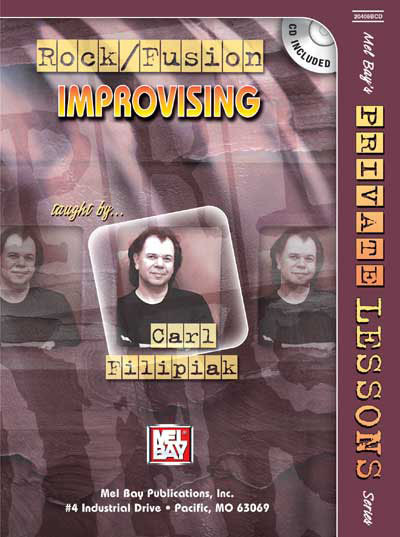 Carl Filipiak’s Private Lessons Series on Rock/Fusion Improvising is the perfect vehicle for the rock guitarist who wants to add elements of jazz to their playing. Discover many of the concepts that fusion, jazz, and “jam bands” use. Intervallic harmony, diminished scales and how to use them are just a few topics that are covered. Take your blues/rock licks to another level! This play-along CD includes odd-time signatures, funk and Indian grooves and features Carl Filipiak on guitar and a smokin’ rhythm section, which includes John Thomakos on drums and Steve Zerlin on bass. Also included on one track is world-renown drummer, Dennis Chambers.